I was diagnosed with AS in 1984,when i was 26 , although I had plenty of signs( which went unnoticed or were ignored by my family doctor) as early as 1977, when i was 19, such as two bouts of uveitis ( I was just given the steroid drops and atropine drops ) ,plus sciatica type pains in my lower back and hips.. Although my back got stiffer and was often very painful ,I managed to work as a painter and decorator until 1997, despite the pain and discomfort. I found the stretching to paint ceilings etc good for my AS. In 1995, I had a serious car crash ( not my fault!) which resulted in a rapid downturn in my physical abilities and a major 2 year flare up of my A S.
I stopped working in 1997 and the department of social security doctor who examined me asked why i had left it so long before giving up work. i told him that i was determined to pay my way in life for as long as possible and that i didn`t want to become a “social scrounger”. I got told off by him for calling myself that! 15 years and 3 more non fault car accidents later, my AS is having a big impact on my life and i struggle to go fishing ( my lifelong hobby) and can only go if my friends go with me. Going out socialising is difficult,as i cannot drink standing up and cannot sit for very long unless surrounded by cushions, even then it`s uncomfortable! Travel is difficult and i only travel places by car if the journey is less than an hour. I`ve started etanercept tnf blocking injections, which seem to have helped me a bit.hopefully i won`t develop severe side effects as i did with Humira and infliximab anti TNF treatment! 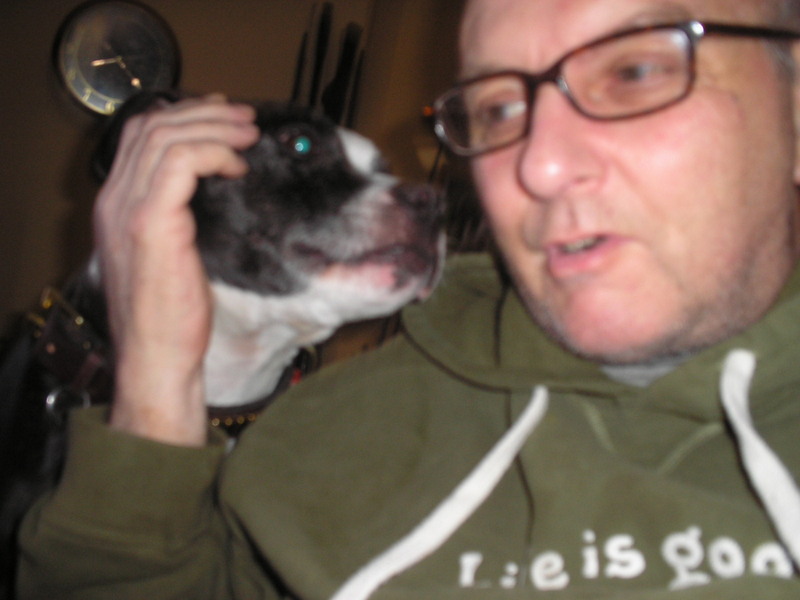 Although i`m single and live by myself, my Staffordshire Bull terrier Ronnie keeps me sane and gives me the motivation to go out for a walk with him. I have brilliant friends andrelatives who help me domestically if and when i am unable to do things. Thanks Pete. Love your puppy! I hope the Enbrel injections help you. Hi Pete, thanks for sharing. I am going to try my best to get out the trout season opener in 11 days. Not sure I can get to my spot, but gonna try! Thank you so much for sharing your story with us. I love your puppy, my husband’s name is Ronnie also. Wishing you the best. Hey Pete…Thankfully you, me and everyone on here are no longer alone as i’m sure we all once thought! Let’s all kick AS into touch!!! Thanks for all the lovely comments guys, it`s good to know that we are not alone facing and fighting A S.